After the incident in Ephesus, Paul left and traveled to several cities. 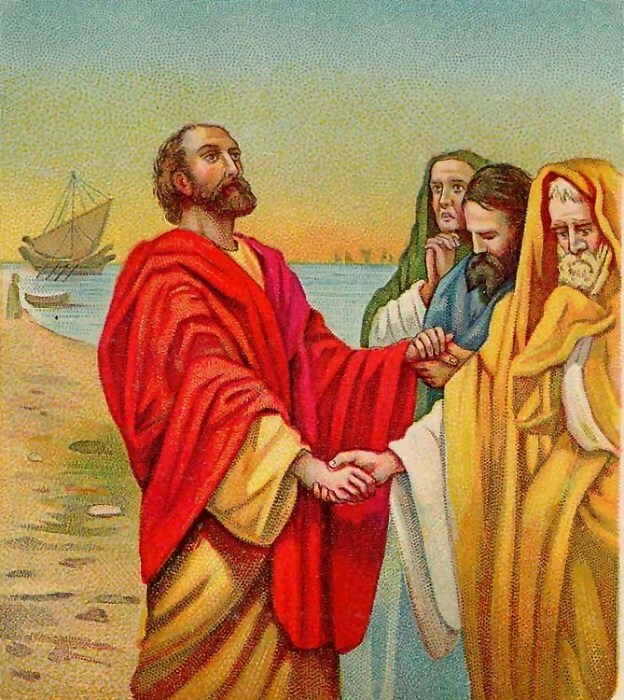 In Troas (TRO az) he met with the disciples on Sunday. They were in an upstairs room and Paul was preaching. He kept on talking until midnight. There was a young man named Eutychus (YOO tikus) sitting in a window. As the sermon went on and on, he became drowsy and went sound asleep. The window was open, and he fell out and hit the ground. When they picked him up, he was dead. Paul went downstairs, put his arms around the boy, and he was brought back to life. The people were so happy to have him back again. When Paul got to Miletus (mih LEE tus) he sent word for the elders of the church at Ephesus to meet him there. When they were gathered together, he talked to them. He told them how he had preached the truth to them. He knew that hardship and persecution awaited him in Jerusalem. He urged them to be good shepherds in caring for the members of the church. Paul knelt down with them and prayed. They all cried and hugged and kissed him. They were extremely sad because he had told them they would never see him again. Then they went to the ship and Paul departed. Do you think Eutycus was the only person who went to sleep that night? Do you think he lacked interest, or was he just too tired to stay awake? We don't know the answers to these questions. On Saturday night do you get to bed on time so you will be fresh and wide awake the next morning on the Lord's day? We need to set our priorities and think ahead. What we do today will affect our behavior tomorrow. This page displayed 41,328 times.